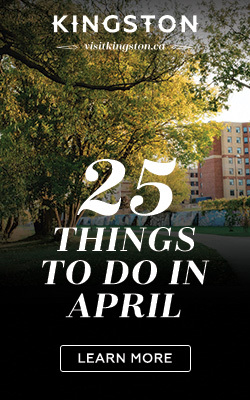 Whether you’re in Kingston for a day or a week, it won’t be easy getting to every restaurant, museum and historic site that makes this city famous. 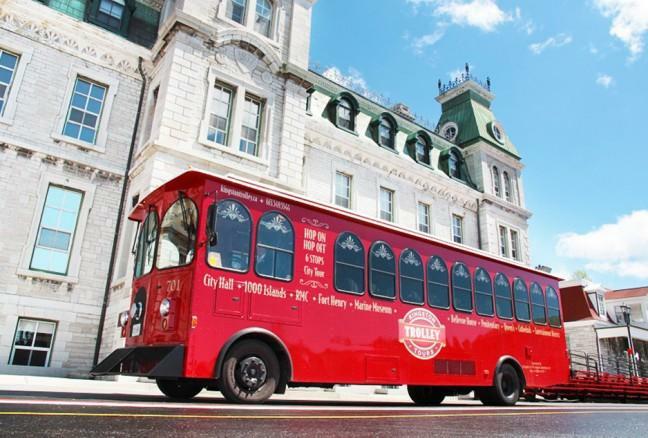 My advice: take a Kingston Trolley tour where, you can hop on and off a vintage red trolley bus at nine of the spots you won’t want to miss. Plus, the ride itself includes a narrated overview of the Limestone City’s three-hundred-plus years of history. 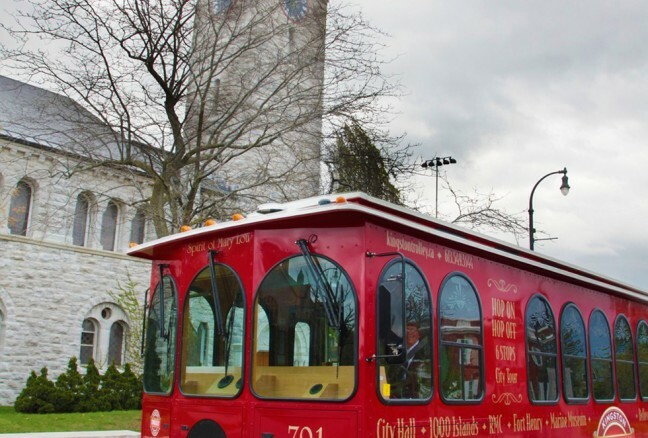 Read on for a rundown of the nine stops on a Kingston Trolley tour and how each plays a crucial part in telling Kingston’s story. 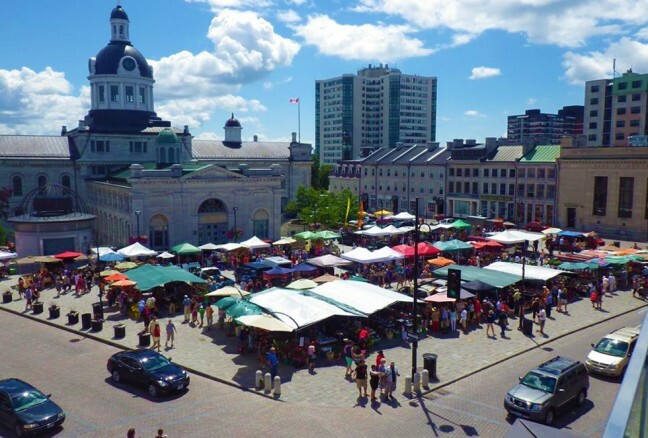 Your tour starts near City Hall, the seat of Kingston’s municipal government since 1844, when the city was still the capital of the United Province of Canada. Take a free guided tour every day of the week to get the inside story on why the council chamber was once used as a medical college, how a fire destroyed almost half the building and way more. For the next stop, you’ll head over the causeway to the Royal Military College of Canada (RMC), a degree-granting university established in 1874 that trains students on all subjects related to the military profession. Check out the RMC Museum from 10 am – 5 pm daily for info on the college’s history, former cadets and the beautiful site (free). Built from 1832 to 1837 atop Point Henry, Fort Henry’s purpose was to protect the naval dockyard at Point Frederick, the entrance of the Rideau Canal and Kingston, once a major transshipment point. Once inside the wooden gates, you’ll step back into the 19th century with a little help from guided tours, musical performances and military demonstrations. Hop off for a stroll through the public market three days a week. You get two attractions in one at this stop. The Marine Museum of the Great Lakes highlights the history and growth of shipbuilding, the life of the sailor and Kingston’s maritime history. At the Pump House Steam Museum, learn how steam power played a key role in Canada’s industrial development and Kingston’s history from the museum’s most incredible artifact—the museum itself. Canada’s first prime minister, Sir John A. Macdonald, rented this house in the 1840s. He wrote that he was drawn to “…the complete quiet and seclusion of the house, which is completely surrounded by trees and has a fresh breeze every blowing on it from Lake Ontario…” Now restored to the 1840s period and staffed by costumed interpreters, the house and gardens are kept much as they were when Macdonald lived here. Penitentiaries have always played a big role in Kingston’s development. 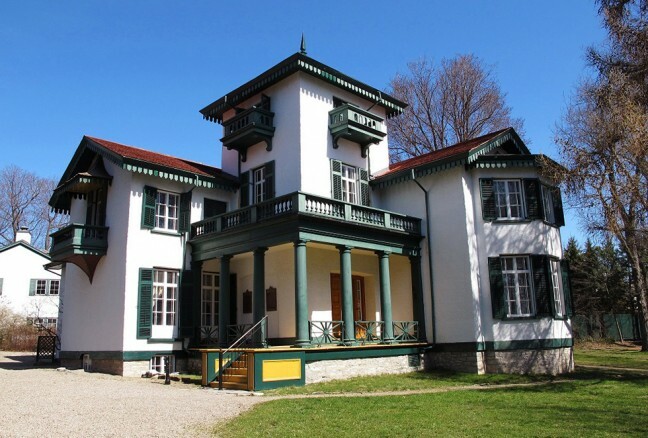 Find out more about that history at this award-winning museum located within the former residence of Kingston Penitentiary’s warden. During the summer, the museum is staffed be retired correctional officers, who provide first-hand accounts of life in the prison system. Queen’s is one of Canada’s oldest degree-granting institutions, and has influenced higher education since 1841, when it was established by the Royal Charter of Queen Victoria. With a beautiful waterfront campus made of limestone buildings and modern facilities, it’s a great spot to wander for a few minutes or a few hours. The final stop sets you back in the heart of Kingston to eat, shop, see a show or just take in the energy that makes downtown such a thriving community. You’ll also have the chance to visit St. Mary’s Cathedral, which houses the chair of the first Roman Catholic bishop in English Canada, and St. Andrew’s Presbyterian Church, which opened in 1822 and was instrumental in establishing Queen’s University.